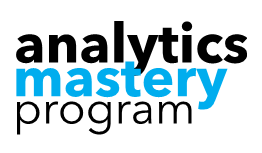 Registration is now closed for the Digital Dojo Analytics Mastery Program. If you are interested in finding out more the next time we open registration, send us an email and let us know you’re interested. In the meantime, check out our blog for posts that can help you boost your analytics capability across a broad range of topics such as Google Analytics. Interested in visualization? Check out our Data Studio gallery. If you’ve checked out these posts and getting notified about new posts interests you, we invite you to sign up to receive our Common Sense Analytics newsletter here.